Although in the early stages we can already certify that no clear, opal or white polycarbonate is removed to landfill from our Protool (Manchester) site, with all waste being granulated and re-compounded for use on new products. We aim to achieve this in our Fareham facility by the middle of 2019. The project which is being headed in Manchester by Operations Director Ian Hunter takes sprues, reject parts, recycled lighting and electronic components and via our granulation and re-compounding process produces standard 25Kg bags of high-quality polymer for use in our moulding facilities. Initially aimed at cost saving and environmental protection for our existing customers The Protool Plastics Group are now ready to offer this to new customers across the UK and Europe. 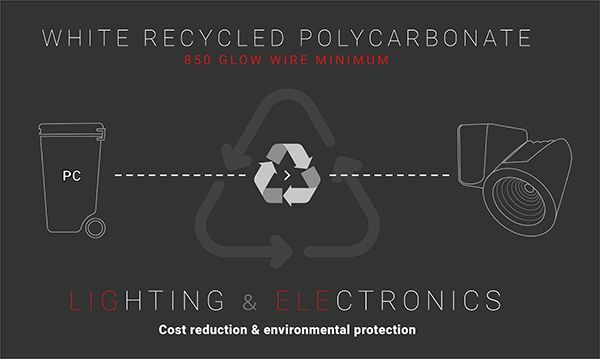 The polymer feedstock is all from 850 & 960 glow wire clear, opal and white (RAL9003, RAL9010 & RAL9016) polycarbonate producing a very clean non RAL specific white blend. Current recycled grades offered by The Protool Plastics Group are PC (white and black) & PP (natural and black). Greater resource productivity reducing the need for virgin feedstock. Reducing the environmental impact of our product consumption.